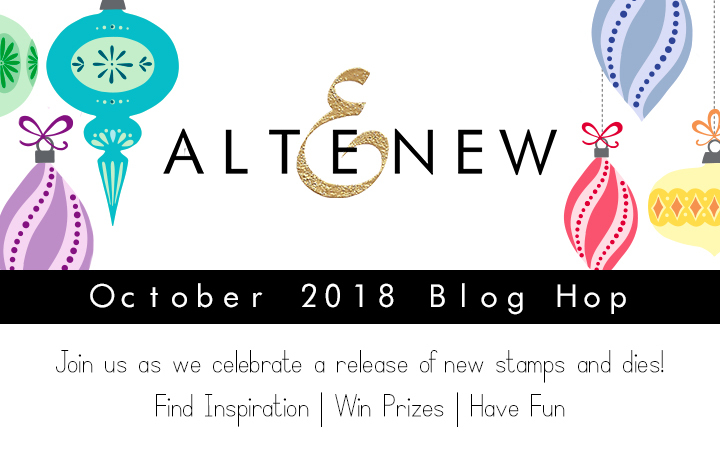 Hello and welcome to the Altenew October 2018 Blog Hop! There are some really beautiful new stamps and dies being released this month. Go HERE to see ALL the NEW products! To celebrate this release, Altenew is giving away a $50 Gift Certificate to SIX lucky winners! Please leave a comment on the Altenew Card Blog and/or Altenew Scrapbook Blog by 10/17/18 for a chance to win. SIX winners will be announced on the blogs on 10/20/18. 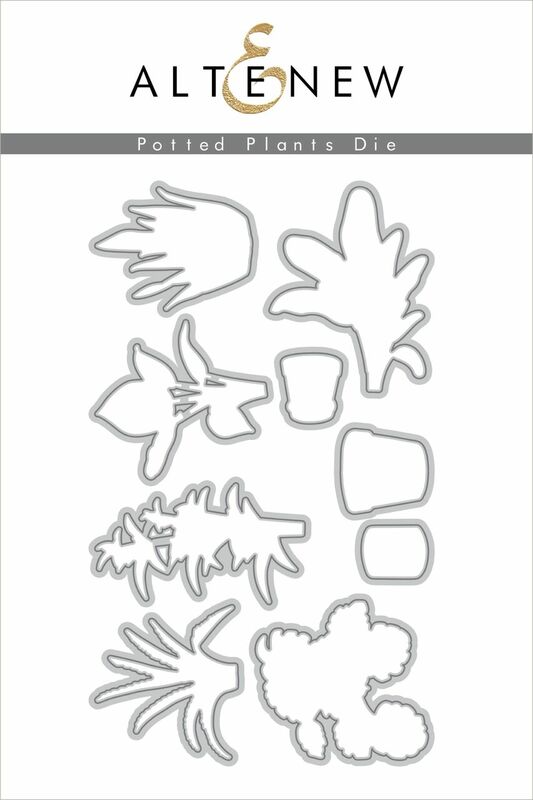 I created a layout using the Playful Blooms Stamps & Dies and the Potted Plants Stamps & Dies. I was inspired by the pretty leaves, and they made me think of the tropics. So I went with a bright and colorful color scheme and created lots of bold flowers and leaves. I used a variety of distress oxides from my stash to stamp lots of green leaves and multi-colored flowers. 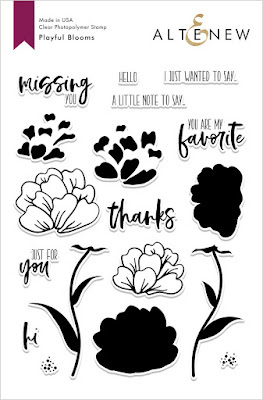 The flower stamps are really cool because you can layer them. There are three stamps...the solid base (one color), the petals (a second color), and the outline (a third color). I played around with lots of color combos and came up with some really fun looks. Once they were all stamped, I used the coordinating dies to cut them out on my manual die cutting machine. I know a lot of people like their stamped images to be crisp and clean, but I like mine to look a little messy. I did stamp them on smooth mixed media paper, but the distress oxides made them look a little splotchy. I love how they turned out! I spritzed some of the flowers with water to make them have more of a watercolor effect. I also fussy cut a few watercolor shaped images from one of the patterned papers in the Our Family collection by Altenew and used them as layers behind my photos. Once they were all cut out, I layered them around my photos and around the page. I used the same distress oxides on my background. I used clear gesso first, and then just smeared the ink pad down on top of it. I spritzed it with water and watched the color run and blend. I used my small acrylic stamping block to smudge the color around at the bottom a bit. Here are more close-ups of the flowers and background. This "together" die cut is from the Our Family collection, and I added color to it to match my flowers. Here is the full list of the Blog Hop designers. Be sure to visit all of these blogs because many of them will be giving away a $30 GIFT CARD to Altenew! I will be giving one away, so be sure to leave a comment here :) I'll announce a winner on October 17, 2018 here on my blog. Thanks so much for stopping by, and have a great time hopping! Good luck to you all! Your layout is so pretty. Love all the flowers. I love your pretty page! The colors all blend together so beautifully, and I love all of the pretty details! Beautiful layout, I absolutely love the colours! Love your layout. The colors are so beautiful! What a stunning layout! I love the bright colors! What a creative way to use the stamp sets in such a wonderful layout. Thanks for sharing this gorgeous layout. Love this layout! So pretty! takes it to an elegant level. Love your beautiful photo layout! Your use of color inspires me, since I love color, you did an absolutely beutuful base for some beautiful people. Missy your LO is so colorful and playful it Makes me smile ! Thanks for the inspiration! Such a pretty riot of colours on your layout, you look like you had a good time arranging all those blooms. Total cuteness!! Thanks for sharing!!!! Just love your layouts and techniques. I'm encouraged to try mixed media layouts now! This layout page is gorgeous! Love the design and the colors. What a gorgeous page! I love the layers and all the colors! SO FUN! Beautiful layout! Such fabulous layer, color palette and movement. Fantastic! I LOVE the whole page...the layout, the colors, the flowers, the sentiment. Beautiful!! What a fabulous layout. Beautiful colors and design. i Love your layout, the background is something i am going to try very soon! 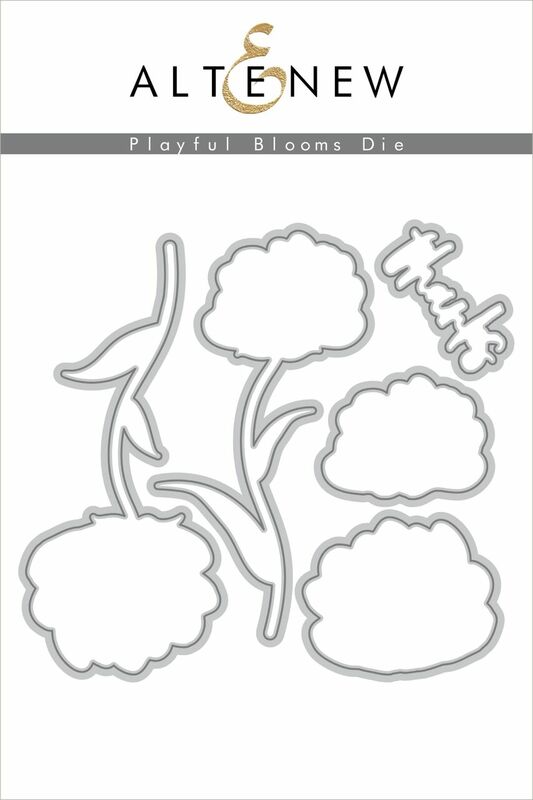 and the floral stamps look very versatile! thanks for sharing. Great layout! So tropical. Bring on the little umbrella drinks! Pretty! That color combination definitely looks tropical! LOVE your CHEERY design, perfect for the sweet photos! Beautiful layout! I love the colors and the "messy" stamping. A beautiful colour scheme on this adorable page. 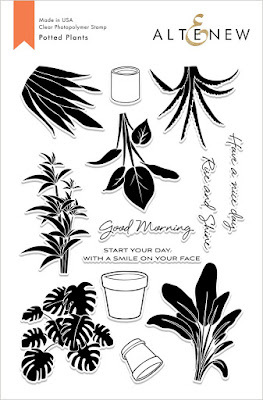 Beautiful page and I agree that "messy" stamping is very effective. What a gorgeous layout! I love it. Your layout is gorgeous! I love all your creations! I just love how all of the colors layered and worked together! So much fun! I never get tired of watching your YouTube videos, you are such an inspiration. Love your layouts. I love your layouts. I'm a new scrapbooker and you inspire lots of ideas. Continue creating your beautiful pages. Your page is so festive. Feels like a tropical adventure to me. Nicely done. What a beautiful layout! Love it. Yes, indeed your layout looks like the tropical areas, I thought of Hawaii as soon as I saw your design. Lovely. Simply beautiful layout! So many wonderful layers and details! Gorgeous scrapbook page! Thanks for all the detailed pics and making a video! What an amazing layout. Love the layers and beautiful colors. Adorable layout using the new products! Wonderful colors! One of my favorite set from the release is the Playful Blooms! Love your layout! Love how you created the background....definitely trying that technique! The colors are beautiful! Awesome layout, the colors are beautiful and the page looks fantastic. Thank you for sharing your talent with us! Such creative ways to use the Altenew sets. Thanks for sharing! 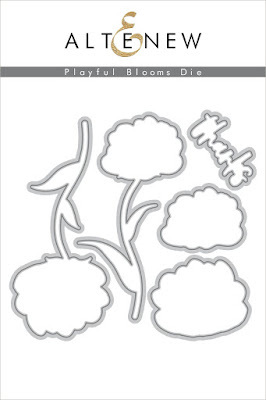 Isn’t playful blooms a great set? Love your layout! Such a pretty layout! Love the colorful, tropic theme and the way you layered and blended the Playful Blooms. It gives them a lovely watercolor look. Love the colors...love the layout! Your scrapbook pages are GORGEOUS! I love that you said some of us wouldn't like it because it wasn't crisply & cleanly stamped! I'm one that wants everything precise but I love this layout! It is beautiful & very artistic looking. When I do "messy" it just looks messy, not artistic. TFS! Your layout is so well done. Thanks for showing a new way to use the stamps. I love your splotchy flowers! They look so natural and coupled with the gold embossing your page is just stunning! Beautiful layout! I agree that some of these new Altenew florals look even more special when the stamping is a little messy & organic looking. Very artistic! What a gorgeous layout! Love the bold colors/paint in the top corner and of course those florals! Oh, Missy, I am a "gotta have it all kind of girl!" I like it messy and then I like it neat and clean too, so this layout is right up my alley - at least one of my alleys! The colors are beautiful and the entire page wonderful. Love your work, and especially how you walk us through the process. It certainly demystifies mixed media. Thank you for sharing your work for inspiration and for a chance to win. Beautiful layout. Love your color combo and gorgeous design! OH MY GOSH!! This is so gorgeous with vivid colors and inks!!!! Fabulous page!!! Love all the bright colors and playful florals. Great video too! I really like the color layering you got with the oxides. I haven't quite cracked how to use them in layering, so maybe this is the answer: just loosen up. Thanks for sharing this lovely layout with us! I love how you created you background for your scrapbook layout. It turned out terrific! Very colorful and a fantastic presentation. Thanks for sharing your time and talent with us. Wow! Such beautiful and bright colors! 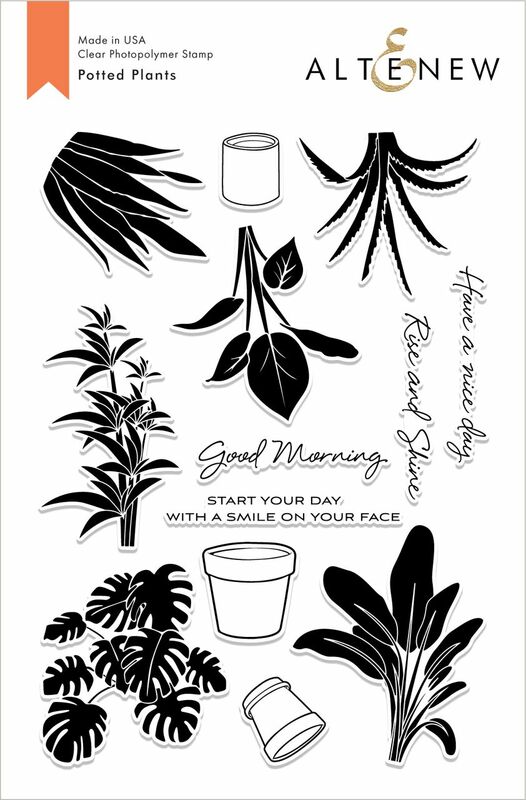 I love how you combined the two stamp sets to make such lovely layout. Thanks for the inspiration. As a fellow scrapbooker, I really love your page! All the details, the layering, the colors---just stunning! Thanks for the inspiration! Love those colors with these stamps... so pretty!!! Love, love, love your page! Love how you created the background paper (I've got to give that a try), how you painted your flowers and title. Love the "messiness" of it! 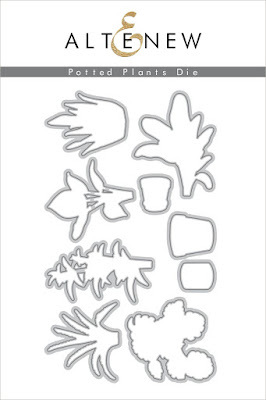 I can't get over those potted plants! fun layout!! Your layout is very colorful and fun!! Very beautiful!! 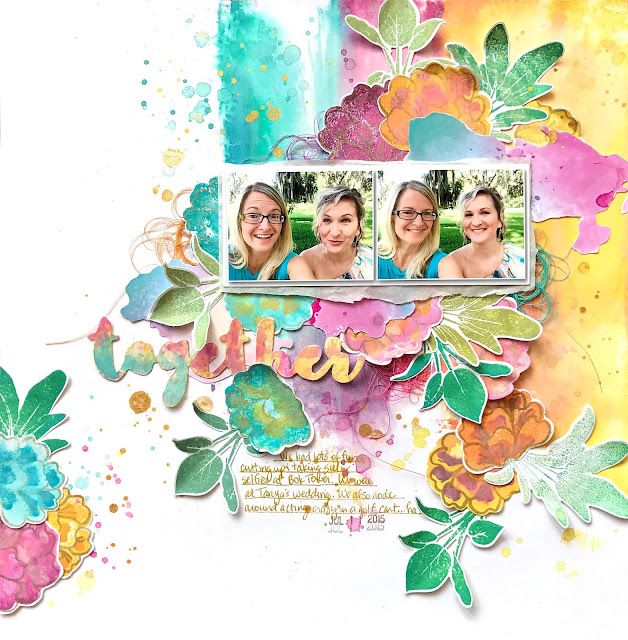 Great layout with the layers of flowers and colors you used. thanks for sharing. Gorgeous layout. Your creations are always so inspiring!!! What a great process video! I absolutely love your gesso + DOX background. Bravo! The new release is really awesome! And I absolutely love the inspiration! What a beautiful layout! So fun with those bright cheery colours. Thanks for the inspiration! Very nice layout. I love how bright and fun it is! Hi Missy! I love your bright and cheery color palette! The flowers look organic and beautiful too! Thanks for sharing! Very pretty pages....scrapbooking has been put aside for me for a bit...but I always seeing beautiful work. Thank you so much for sharing. Beautiful layout! Love the colors! I'm enjoying all the inspiration along the hop! Beautiful, colorful, fun page. I love this release.